If you’re searching for the perfect family boat, you may have run across a question that lots of folks have asked — what’s the difference between a deck boat and a bowrider? While both are great options for dayboating, each has its own strengths, so the best way to compare is to put them side-by-side and see what’s best for your family’s needs. The first thing you’ll notice when comparing bowriders and deck boats is that they look a little different. But, other than the shape of the hull and forward deck, you can find similar styling options such as hull graphics and gel coat colors that range from wild to mild, depending on your personal tastes. As you are searching for your new boat, you’ll likely discover that certain manufacturers design boats that seem to match your family’s personality. Because of the different hull shapes, bowriders and deck boats will tend to handle in a different way. Again, this is a personal preference. 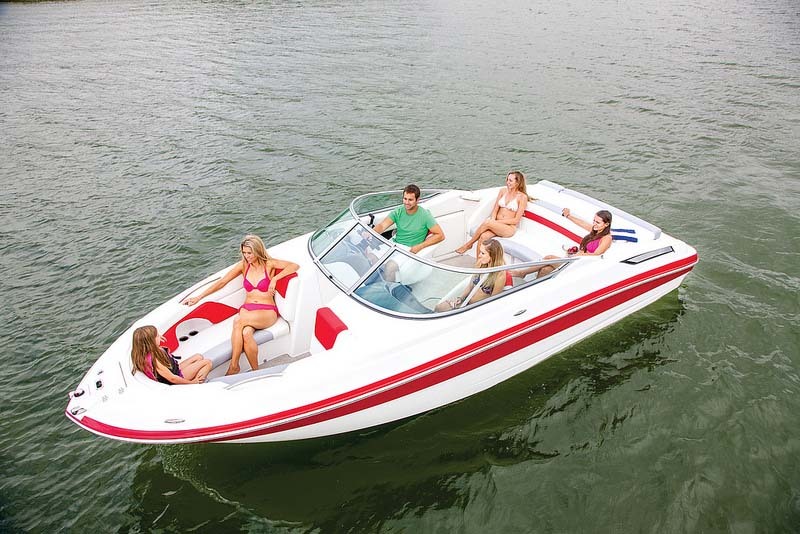 While deck boats will have flatter bottom and a little less bowrise (the lifting of the front of the boat when accelerating), bowriders will have some type of V-hull, which comes to a point in the front and generally turns more sharply, particularly at higher speeds. If you’re shopping for a family boat, chances are at least someone you’ll be bringing along on the water will want to participate in some type of watersport. That can be anything from swimming to wakeboarding to tubing. Most deck boats and bowriders will have some type of “tow eye” at the back of the boat that’s bolted into the deck for you to secure a towrope. Many also give you the option of adding a tower or other type of elevated point of attachment point for the rope. Be sure to check out those features, along with the size and ease-of-use of the rear deck/swim platform. 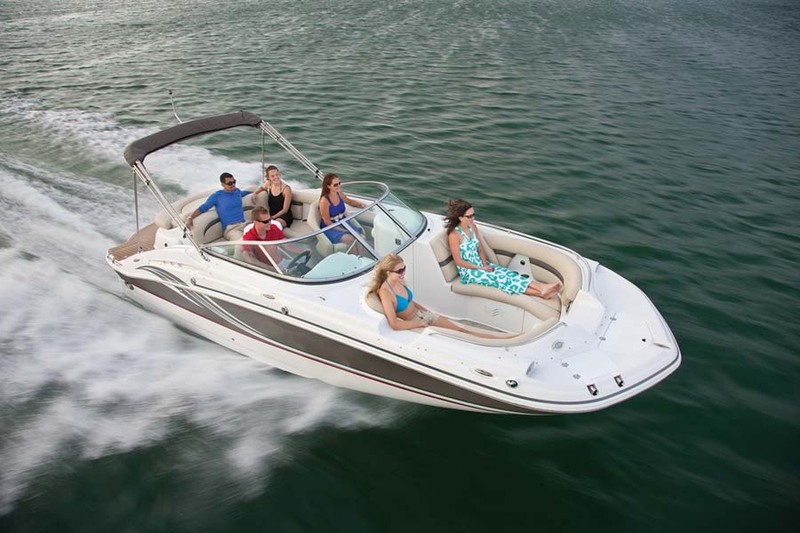 You will usually have more seating and storage aboard a deck boat, compared to a bowrider of the same size. This is because the beam (width) of a deck boat is carried further forward, rather than tapering off to a point like a typical bowrider. Some people, however, prefer the styling and handling advantages of a bowrider. That’s particularly true if you will usually be hitting the water with a smaller crew and don’t need the extra storage and legroom. While both deck boats and bowriders are built strong to withstand a wide variety of water conditions, there are inherent differences. On flat calm water or even a light chop, there is very little difference in the feel of the ride. Since this will likely be the type of condition you’ll see most of the time on protected lakes and rivers, it may not be a big issue for you. But the flatter hull of the deck boat won’t be quite as effective as the V-hull of a bowrider at slicing through waves if the wind should kick up or if you’re on bigger water like a bay. On the other hand, the width and stability of a deck boat are points worth considering, particularly if you have young children on board.